1. Shuffle Off to Buffalo Let us just take a moment to love and appreciate this incredible buffalo check coat. Not a massive fan of red, but for you @ jacket, I would. 2. Two Ways to Style a Black and Gold Jacket I definitely agree with Jessica that black and gold make for the ultimate holiday look. Plus a red lip? Absolute perfection. 3. Baby, It's Cold Outside! 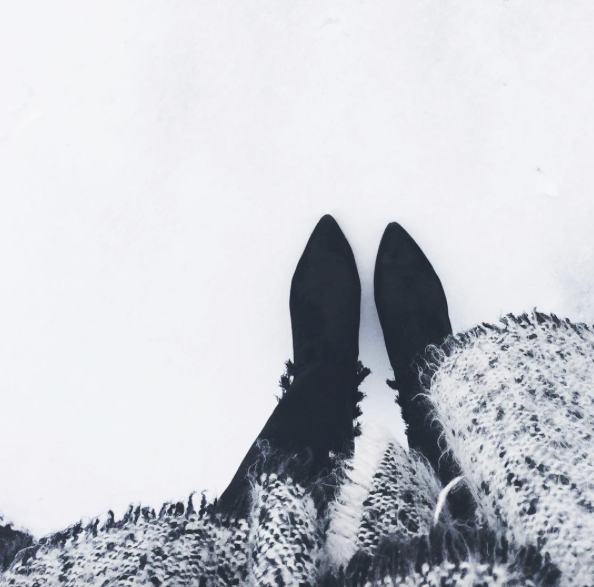 Beauty Tips for Cold Weather As someone who's body just generally doesn't react well to the cold–cracking knuckles, dry skin on my face, moisture drained from my hair–this post came at the perfect time. 4. Red for the Holidays In l-o-v-e with this one shouldered ruffle top. 5. I Refuse to Feel Bad About My Phone I saw a comment that summed up my feelings entirely: "I refuse to feel bad about something that objectively makes my life easier and better." Amen to that! 6. Chanel Métier d’Art is a Beautiful Escape Tweed will never die in the world of Chanel. 7. Thigh High Introverts I think the second ultimate dream shoe–behind the Gucci shearling Princetown slippers–are the Stuart Weitzman over-the-knees boots. But which? Lowland? Midland? Highland? So many choices! 9. New Fendi Bag Holy handbag...I think I'm in love.